A corn is more than just a vegetable we make popcorn from or a side dish at thanksgiving; its actually the colloquial name for a fairly common foot condition affecting millions of Americans everyday. A corn is a collection of thickened dead skin that accumulates either on top of, in between or on the tips of the toes. 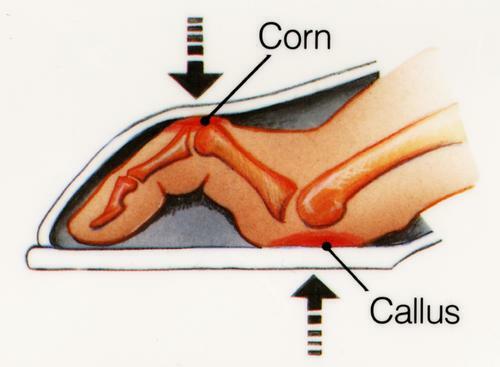 Two things are necessary for the corn to develop, some kind of toe deformity (the most common one being hammertoes) and friction. While a toe deformity takes years to develop, a corn itself does not take very long. A hammertoe makes certain areas of bone prominent to friction from shoe gear. In its infinite wisdom, the skin tries to thicken itself to protect these bones from damage. However, over the course of days and weeks the thickened skin dries out and becomes hard. As friction continues this causes pain. The best way to treat a corn is to see your podiatrist. Although there are many over the counter corn removing products, in the long-run they are all ineffective because they do not address the two root causes of corns. As a result, over the counter corn products are an exercise in futility, and you are smarter than that!